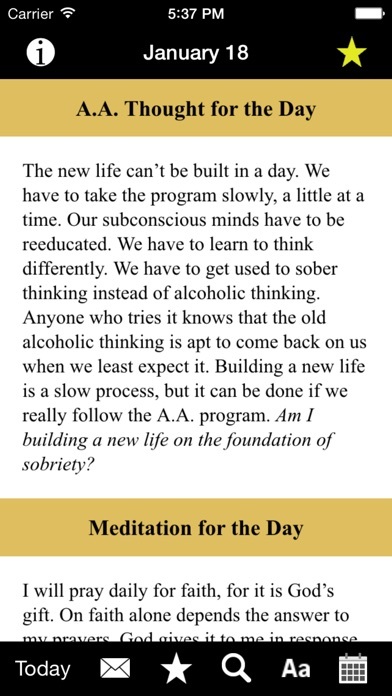 One of Healthline’s Best Alcoholism Apps of 2016 Find inspiration anywhere, at any time, with Hazelden Publishing’s Twenty-Four Hours a Day app featuring all 366 daily meditations from the classic best-selling meditation book for people in recovery from addiction. At the touch of a fingertip, Twenty-Four Hours a Day becomes your companion, making it easy to focus on your sobriety wherever you are. Practicing the Twelve Steps has never been more accessible. What Users Are Saying: “I travel a lot for work so having this app makes it great to have something to read if I cannot get to a meeting. 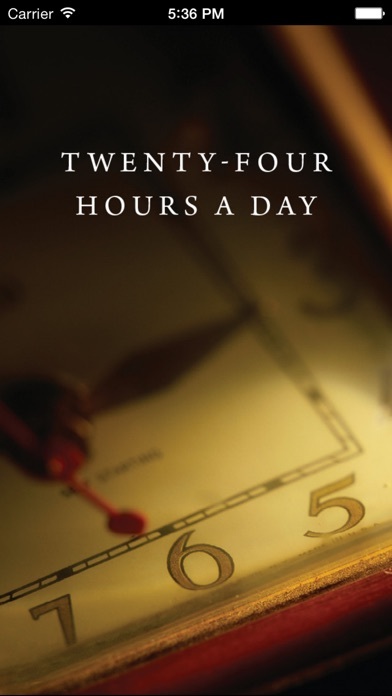 Easy to use and to move between days.” “Great daily meditation with features that make it easy to share the readings with family and friends.” “Had this book for many years and it has helped me time and again. Glad to have it on my phone now.” “This app is my roadmap! It keeps me pointed in the direction of my highest good every day.” Features: PRESS the “Today” button to access today’s message. SWIPE forward or back to easily access more daily messages. 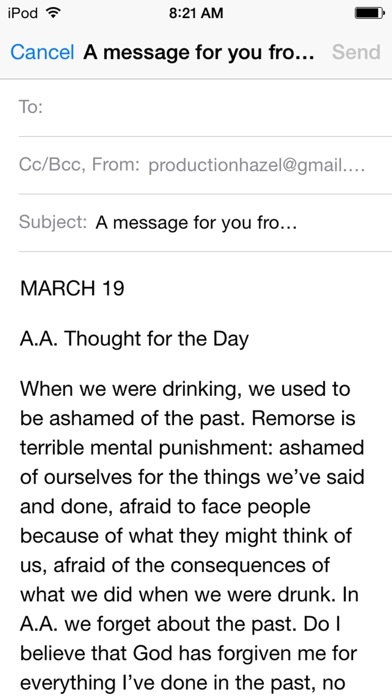 SHARE the daily messages with friends through an automated sync to your e-mail or text. BOOKMARK your favorite meditations (press the star in upper right-hand corner) and easily return to them (press the star in the bottom toolbar). SEARCH all 366 daily messages by keyword. RECEIVE a notification every day to remind you to read the daily message. JUMP to a specific meditation using the calendar button. SHAKE your device to bring up a random message of inspiration and support. CUSTOMIZE the size of the font presented for reading ease. Unfortunately, I spent money on an app that talks about “God” in the Christian sense. I would have been more accepting of this app had it not always mentioned God as “He.” Not to mention, the daily readings mention God 95% of the time. They just don’t give it a rest. It’s unfortunate and I wish I could get my money back. I would encourage anyone to explore other apps. The reflections seem highly subjective. I am tolerant and accepting of others beliefs, but to scorn actual modern theory and scientific knowledge is troublesome. Especially when most of us are trying to live a more truthful life. And struggle with a concept of a power greater than ourselves. Below is an actual “reflection” from the daily reflections: “Some people find it hard to believe in a Power greater than themselves. But not to believe in such a Power forces us to atheism. It has been said that atheism is blind faith in the strange proposition that this universe originated in a cipher and aimlessly rushes nowhere. That’s practically impossible to believe.” How is this helpful? 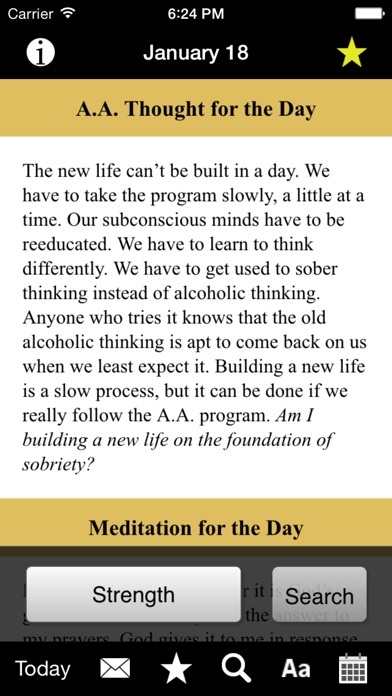 Staying sober with this app!! 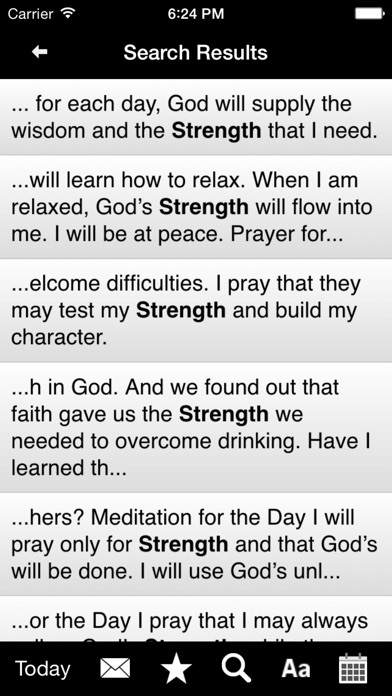 It’s hard work in and of itself, but to have an awesome app that is a go to for me in those quiet times, perfect. Thanks so much. Good to have this app. On hand to restart your day at any time. Some times I’m in a rush and need to take a minute. GREAT! I love this daily meditation. Every time I read it it’s like the first time I heard it. Where you are in the program it’s speaks directly to you! I use this tool daily, thank you! !